The trail camp is closed indefinitely. There is no camping available in the park. Most visitors come to picnic near Aptos Creek or to hike, jog, or bike on 30 miles of trails in rugged semi-wilderness, rising from sea level to steep coastal mountains of more than 2,600 feet. The park also has a trail camp 6 miles from the West Ridge trailhead. The park’s land has a bittersweet beauty. 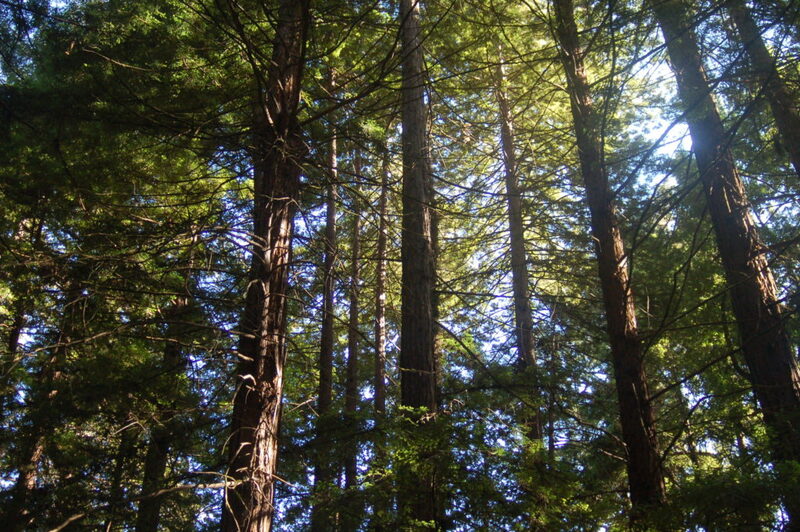 Almost all of today’s redwood forest was cut in a 40-year logging frenzy from 1883 to 1923. When the loggers left the Aptos Canyon, the forest began to heal itself; now, the scars grow fainter with each passing year. The Forest of Nisene Marks is a monument to forest regeneration and the future — it is a forest in a perpetual state of becoming. Use the State Park Drive exit from Highway 1. Go east on State Park Drive to Soquel Drive. Turn right on Soquel Drive. Go 1 mile to Aptos Creek Road. Turn left on Aptos Creek Road into the park. By Bus: Take Santa Cruz METRO route 91X-Commuter Express or route 71, exiting at the Aptos Post Office. Walk west on Trout Gulch Road to Soquel Drive, turn right and walk to the park entrance at Aptos Creek Road. The park is a a recreational oasis with 30 miles of maintained trails and roads for hiking and running. 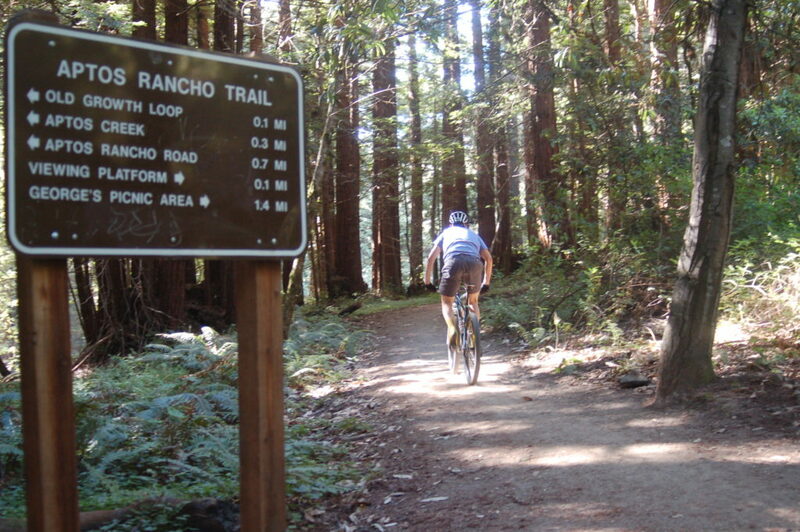 Mountain biking is permitted on Aptos Creek Road and a network of trails in the lower portion of the park, including : Aptos Rancho Trail, Split Stuff Trail, Terrace Trail and Vienna Woods Trail. Horses are allowed below the steel bridge. The park showcases a forest in recovery, with rugged canyons and remnants of its once-bustling railroad and logging industry. Historical panels are dispersed throughout the park. Picnic tables and barbecue pits are available. Parking is $8 and supports the park. Annual State Parks passes also are available to purchase at the entrance kiosk. There is an ADA-compliant trail at the park — learn more in the Hilltromper Wheelchair-Friendly Trails Guide. Field trips are available from April through November. Learn more. The Nisene Marks Volunteer Trail Crew helps others safely enjoy the beauty of the park. The Trail Crew meets at 9:30 a.m. on third Sunday of each month, rain or shine. A typical workday lasts until mid-afternoon. Please bring work gloves, lunch and water, and meet at the park’s entrance kiosk. 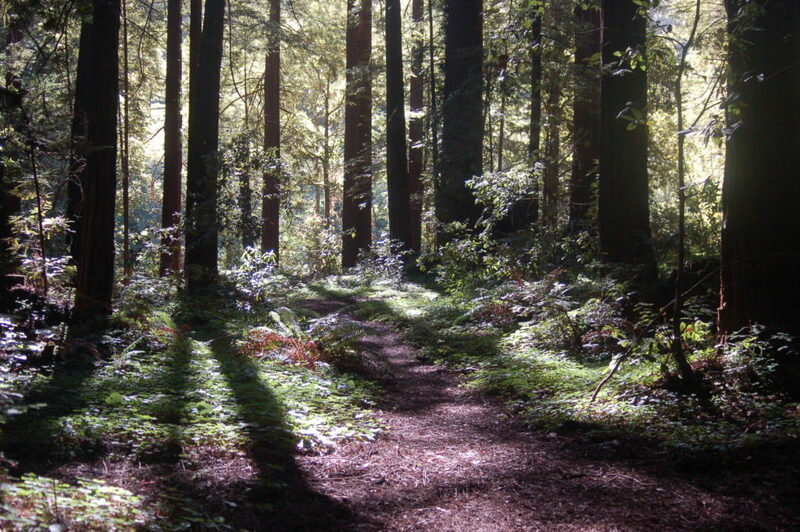 Gain a unique perspective of The Forest of Nisene Marks State Park; enjoy a lively and productive experience with others who share a love of these redwood forests. Learn more. The park’s name honors Nisene Marks, the nature-loving mother of the Salinas farm family that bought the land in the 1950s. Her children donated almost 9,700 acres to the state in 1963 with the provision that the land never be developed. The local first people were the Costanoans (now known as Ohlone). The native people harvested resources on the edges of the forest, but little evidence exists that they ever lived among these deep redwoods. Two Mexican land grants to the Castro family in 1833 and 1844 partially form the boundaries of today’s park. In the 1880s, the Southern Pacific Railway (SP) arrived in nearby Monterey. SP financed the purchase of tree-filled Upper Aptos Canyon, the Loma Prieta Lumber Company and the Loma Prieta Railway. Chinese laborers cut and graded the rail line seven miles up the canyon. By 1883, standard-gauge railway tracks had been built to haul the huge redwood logs to mills. The 1880s cost of building this railroad, part of today’s main Fire Road, was estimated at $50,000 per mile. At one time, the Loma Prieta Mill became the largest in the 19th-century Santa Cruz Mountains, processing an estimated 140 million board feet of redwood. until disastrous landslides during San Francisco’s 1906 earthquake paused logging efforts. 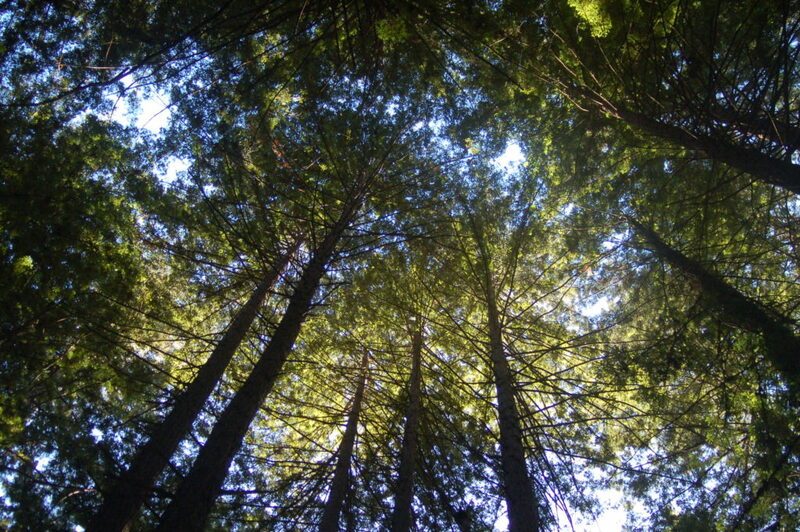 Reforestation began when the lumber company planted 50 acres of redwood and non-native eucalyptus seedlings. Logging continued from 1909 until 1924. Today, the park showcases a forest in recovery, with rugged canyons and remnants of its once-bustling railroad and logging industry. A grove of ancient old-growth redwood trees near the Pourroy picnic area was preserved under private ownership and added to the park in recent years. Three earthquake faults—San Andreas, San Gregorio and Zayante— influence the park’s geology. The San Gregorio Fault runs slightly southeast of park boundaries. The Zayante Fault crosses the park’s Aptos Creek Canyon while the San Andreas Fault, extending nearly the entire length of the state, parallels the park’s northeastern border below Santa Rosalia Ridge. The San Andreas Fault’s devastating 6.9 magnitude earthquake caused upheaval throughout Northern California in 1989. That quake was named after Loma Prieta (“dark hill”), the mountain near the quake’s epicenter in the park. Ancient sea floor sedimentary rocks —mostly sandstone, chert and siltstone with embedded marine fossils — are found in the Aptos and Bridge creekbeds. For most of the park’s history, it was a shallow inland sea. The park’s unstable sandy and loamy soil is susceptible to landslides. 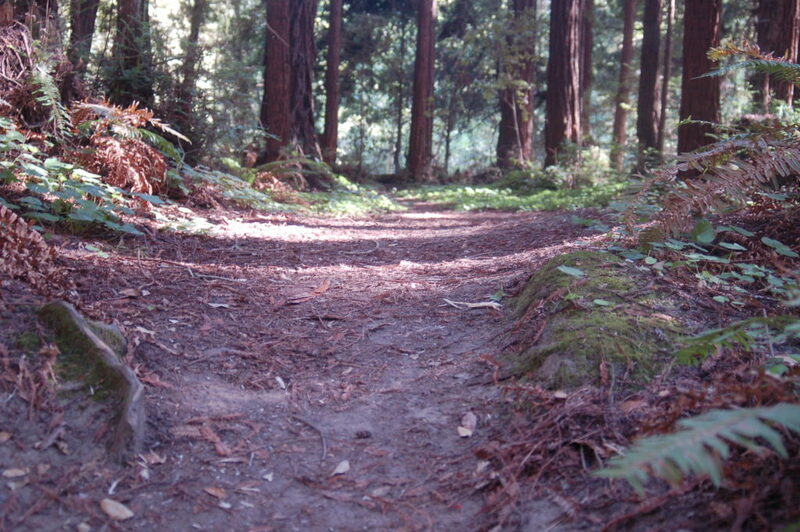 Visitors can hike to the epicenter of the Loma Prieta Earthquake by taking Aptos Creek Fire Road to the Epicenter Trail. Bikes are allowed only on Aptos Creek Road and four “hike-and-bike” single-track trails below the Steel Bridge: Aptos Rancho Trail, Split Stuff Trail, Terrace Trail and Vienna Woods Trail. Except for service animals, dogs are allowed only on Aptos Creek Road below the Porter Family Picnic Area and the four single-track trails below the steel bridge (named above). Dogs must be on leashes no longer than six feet at all times. Horses are only allowed below the steel bridge. Advocates for the Forest of Nisene Marks: Learn more about the Advocates in this video celebrating their 25h anniversary and Organization of the Year award from the Aptos Chamber of Commerce.